Acrylic nails are durable and strong, providing wearers with the appearance of flawless and perfectly shaped nails, even if they don't have them naturally. But with all their benefits, acrylic nails can sometimes cause pain after they're applied. Here are some of the most common causes of nail pain, and how you can cope with it. One of the more common causes of acrylic nail pain is snagging the nail. Since the acrylic powder is adhered directly to the real nail, gripping something incorrectly or even opening a car door can be painful. A nail snag can also cause a crack, chip or break off the entire nail. The pain can last for a few minutes or a few days, depending on the extent of the damage. Cracks occur when an acrylic nail is snagged on something or encounters too much pressure. If a crack is severe enough, it can crack not only the acrylic base, but the real nail underneath. This causes redness, swelling and pain. In the event the crack is severe, the acrylic nail must be removed so that the natural nail can heal before reapplying the acrylic nail. Acrylic nails have a habit of lifting from the base of the real nail. When this occurs, the gap between the acrylic nail and the real nail is left open to dirt and water. 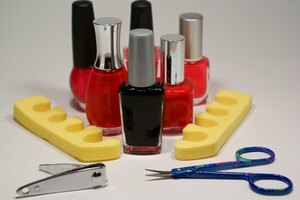 Unsanitary nail salon equipment is also a culprit for bacterial and fungal infections in acrylic nails, which is why it's important to use reputable nail salons that frequently sanitize the equipment. Bacteria and fungal infections cause redness, pain and pus around the base of the nail and the natural nail will begin to discolor. In rare cases, contact dermatitis can occur, which is an allergic reaction to the acrylic nail. The adhesives and materials used in acrylic nails can be harsh to those with sensitive skin, and the result is an allergic reaction. Allergic reactions cause redness, swelling and pain. When acrylic nails are applied, the natural nail is filed down to make a coarse surface for the acrylic base to stick to. When the natural nail is filed down too far, it can cause redness and pain. Over-filing can also wear down the natural foundation of the nail, which can cause further pain if a nail is snagged or cracked. MedicineNet: Nail Salon FAQs, What You Need to Know! 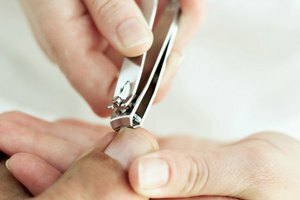 MayoClinic: Acrylic Nails: Can They Harm Your Natural Nails? ; Lawrence E. Gibson, MD.